1) A decline in the participation rate was expected. 2) Although some of the recent decline in the participation rate has been to due to cyclical issues (severe recession), MOST of the decline in the overall participation rate has been due to changing demographics. This morning Mish disagreed with me. His conclusion was: "While the Participation Rate trend is certainly down, and down was expected, most of the decline in participation rate since the start of the recession is due to economic weakness, not demographics." I consider this progress! 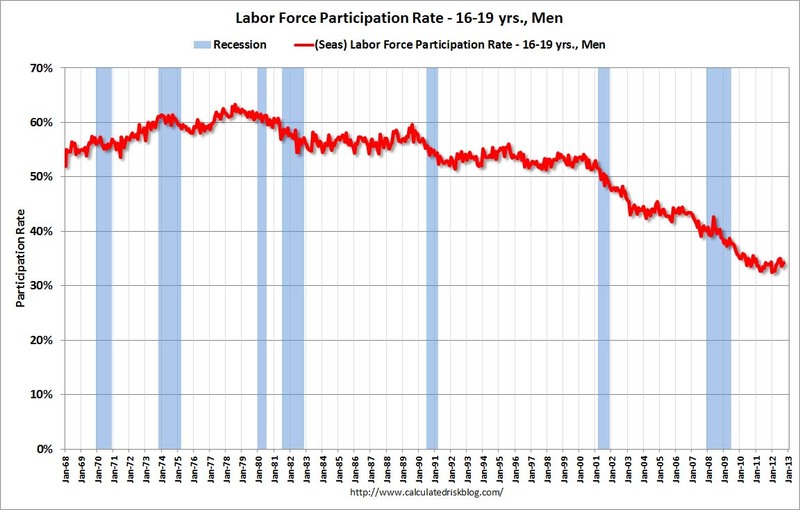 It wasn't long ago that I was still arguing with people that we should expect a decline in the participation rate. Now the question has shifted to what portion of the decline is cyclical (due to the recession) and what portion is due to demographics. 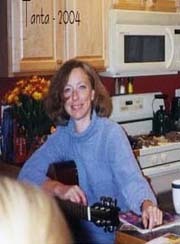 Mish looked at a paper I linked to on Sunday, written in 2002 by Austin State University Professor Robert Szafran, and Mish used Szafran's projection for the participation rate in 2015. However, as Szafran noted in his paper, for simplification purposes he assumed that the "age-specific participation rates do not change" after 2000. However if we look at the 16-to-19 age group, the participation rate declined from 51% in 2000 to 42% in 2007 - before the recession started. Although Szafran's paper is very useful, the actual numbers (because of the simplifying assumptions) are clearly too high. The decline in the overall participation rate, especially since 2008, has been a cause of concern. But the headline number can be impacted by demographic changes (that is why Professor Szafran was estimating an "age adjusted" participation rate - his paper was titled: Age-adjusted labor force participation rates, 1960–2045). Changing demographics makes projecting the overall participation rate very difficult. We do know that a fairly low percentage of people in the 16-to-19 age group participate in the labor force, this percentage increases for the 20-to-24 age group, and then remains high until people reach 55 or so. To project the overall rate, we need to know the trends for each age group, and we need to estimate how many people will be in each age group each year (this depends on mortality rates and immigration - and those change over time too). Here is a graph based on BLS economist Mitra Toossi's projections (another paper I linked to on Sunday). 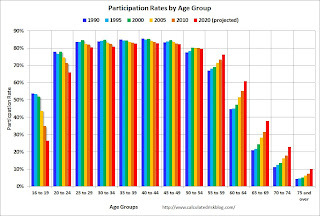 Note that Toossi is expecting a couple of recent trends to continue: lower participation rates for people in the 16 to 24 year age group (I think this decline is mostly due to more people attending college), and an increase in the participation for older age groups (I think this increase is due to several factors including less physically strenuous jobs, and, unfortunately, financial need). An increase in the participation rate for an age group (like the 60 to 64 group) is just one part of the equation. We also have to recognize that a large cohort is moving from the 55 to 59 age category into the 60 to 64 age group, and the participation rate for that cohort is falling. The baby boom generation is obvious. This graph is from two years ago, and shows that a large number of people are moving into the 55-to-65 age group now. 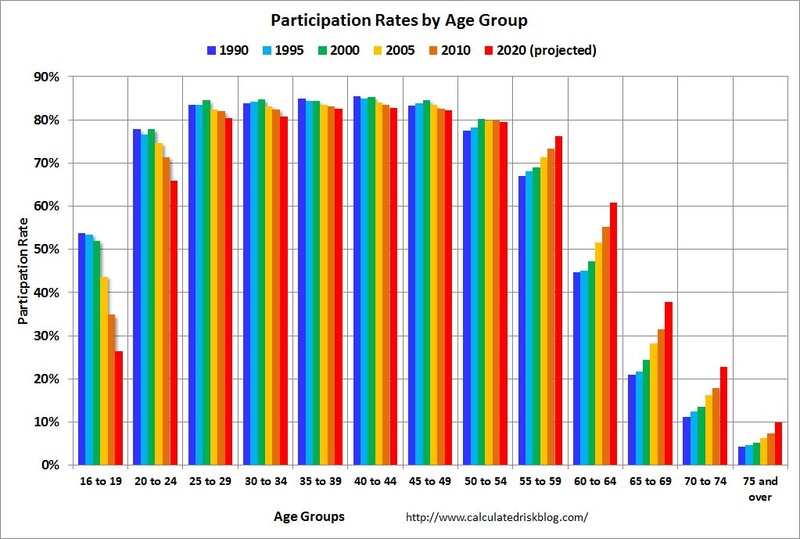 Even though the participation rate is rising for the age group, it is lower than for the 45-to-55 age groups - so that pushes down the overall participation rate. There are changes for other groups too. A fairly large group just moved into the 20-to-24 age group, and they will be moving into higher participation age groups soon (it isn't all bad news). Here is the trend for men in the 16-to-19 age group. As I noted before, for his purposes, Szafran assumed this would stay at the 2000 rate. Instead the rate declined sharply from 2000 through 2007 - before the recession started. How can we tell if the decline since 2008 was just a continuation of the trend, or if it was because of the severe recession? It is very difficult. One idea is to look at a very narrow group (men in the 35-to-44 age group) and look for the impact of the recession. These people aren't going back to school in large numbers, and they are not retiring early in large numbers. What do we see? A long term down trend from about 97% participation in 1968 to about 91% participation now. 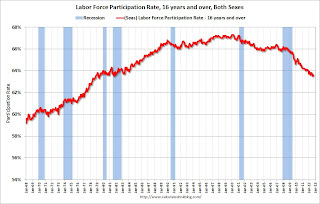 If we look at a short term trend - from 1995 through 2007 - it appears there is about a 1% decline in the participation rate due to the recession (from 92% to 91%). 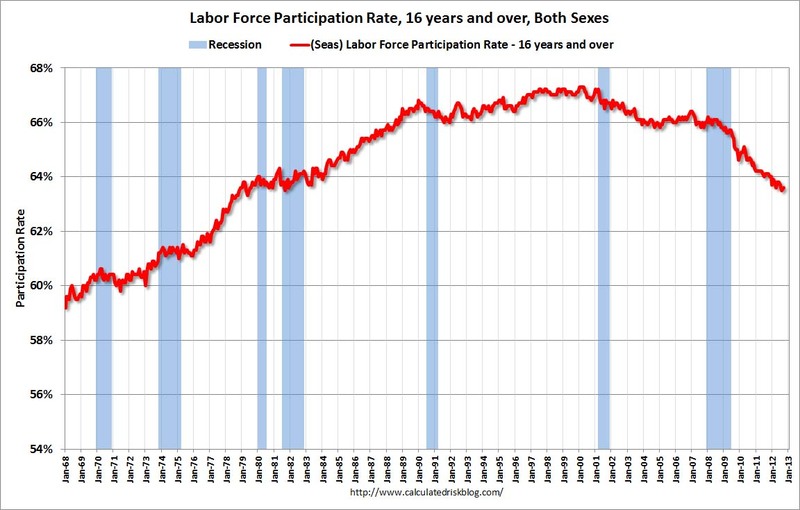 But if we look at a long term trend, it appears the participation rate is about what we'd expect. 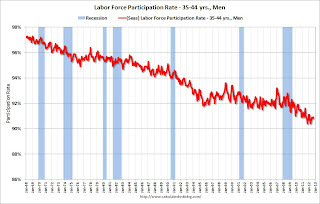 Other groups were probably impacted more by the recession than 35-to-44 year old males (younger groups tend to be impacted more), but I don't think there is evidence of a huge cyclical decline in the overall participation rate. 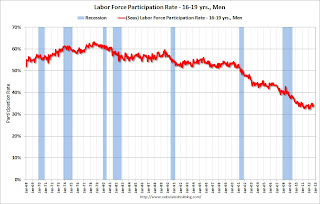 I've looked at many age groups, and although I think some of the decline in the overall participation rate is due to the recession, it appears most of the recent decline in the participation rate is due to changing demographics.